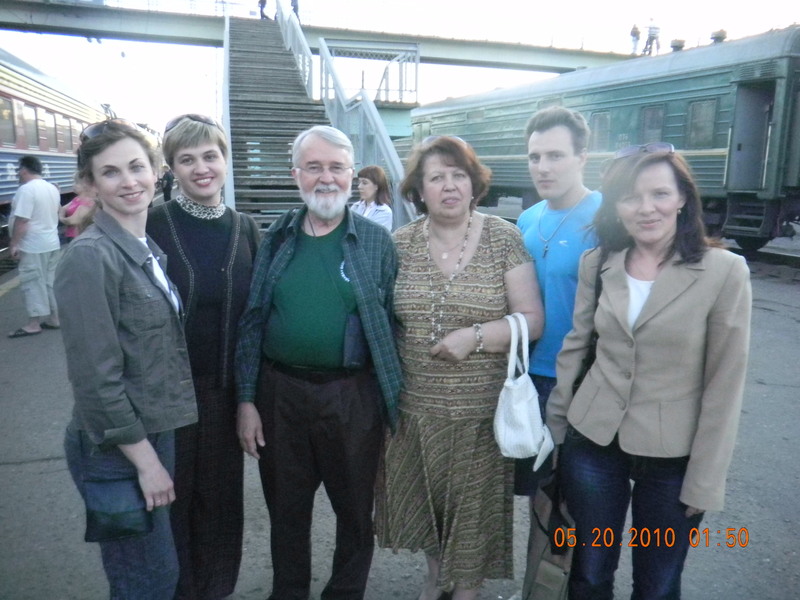 As a special treat and in a gracious act of hospitality, Galina accompanied us to the train station about one hour from the orphanage. The van was driven by her son, Igor, who is a great kid. We had another opportunity to chat and get a tour of the countryside from a local resident. This next part of the trip was certainly going to be the most interesting. Due to the unique nature of this trip and the fact that the six travelers were separated for this portion of our trip, I was allowed to travel back to Vladimir by train without a translator or any other traveler. This is not a common thing in Russia and not highly recommended, nor would it ever happen on a future Mission 1:27 trip. For me, it was going to be the most exciting part of the trip with very little risk as I was being put on the train by a translator and picked up in Vladimir 10 hours later. I can certainly fend for myself during this period of time, no problem. Well, those feelings quickly gave way to wondering what in the world I had gotten myself into. I was introduced to my cabin mates by my translator: Roma, Gala (short for Galina) and Nataliya. She told them that I speak no Russian and to take good care of me. That was met with cold stares, no acknowledgment and certainly no smiles. For the first time in Russia, I wondered where the hospitality was that I had experienced over my two visits to this country. For the first 30 minutes of the ride, no one spoke a word. Very little eye contact was made and I truly did not know how I was going to be able to do this for 10 hours. One consolation was that this was an overnight train, so I would be able to sleep through part of it. Yep – this is how it works. You share a room with complete strangers and you get the luck of the draw as to who those roommates might be. But if you are sleeping on the bottom bunk, you can’t go to sleep until everyone else is ready – it is both culturally insensitive and physically impossible. I was in this for the long haul and it appeared that no one was going to break the ice. Luckily, there is another Russian tradition that I had learned. When you travel on train, one shares his/her food with the other members of their cabin. The orphanage cooking staff (wonderful women who take very good care of us) had prepared a dinner to go for me: a chicken breast, some vegetables (the veggies and fruit are AWESOME this time of year), an omelette (more like a quiche) and some pastries. In addition, Galina had provided me with a gift of traditional Russian gingerbread. I decided that when all else fails, why not break bread together. Plus, I was getting hungry. Without saying a word, I opened the gingerbread and pastries and put them on the table. I then motioned for them to have some and sat back. Immediately, they all went into their bags and put out the food that they had brought: sandwiches, cheese, ham, bread, cookies and the like. Suddenly our table was full – and something amazing happened. Roma, the young 28-year-old Russian male, asked me a question in broken English. “You speak English?” I asked. He noted that he spoke a little after studying it at the university for two years. Over the next few minutes, we were able to begin to communicate. Of course, my Russian is limited to phrases that young children in an orphanage might understand and I did not bring my Russian dictionary with me (a mistake that I won’t make again). But thanks to Roma’s courage and lots of hand signals, the dialogue began to flow between all four of us. We started talking about what I was doing in Russia. It was an interesting (albeit broken) discussion about orphanages and children. As things got tough to explain, I realized that pictures were better than words – and I had hundreds of pictures that I could share with them. For the next hour, we looked at pictures and videos of our time in Russia and Slobodskoy. They then started to ask questions about the US and North Carolina. We were on a roll, so I used the PowerPoint presentation that I gave the kids in Slobodskoy to talk about life in the US. It was crude and the Russian was terrible, but the points got across and they seemed to understand what I was saying. For the next four hours, we all just chatted, laughed and tried to learn about each other. It was a much later night that I had expected or wanted (I had planned to blog on the train) but the experience was priceless. What at first pass looked to be a long and lonely event in a strange country turned into a meaningful encounter with new friends in a welcome and hospitable place. I slept well that night, comforted by the recollections of a new experience in a week full of them. I am struck by the lessons of this train journey. Sometimes, all you need to do is break bread with someone, show them some pictures and share your life with them. Pretty simple stuff that can lead to powerful memories and relationships.